The “new reality” facing electricity consumers and their utility companies is that renewable energy is meeting an increasingly larger share of U.S. energy needs, according to a report released this month from Ceres and Clean Edge. That translates into more and better choices and a clean energy future. “Renewables — including wind, solar, biomass, geothermal, waste heat and small-scale hydroelectric — accounted for a whopping 49 percent of new U.S. electric generating capacity in 2012, with new wind development outpacing even natural gas,” writes Jon Wellinghoff, partner at Stoel Rives LLP and former chairman of the Federal Energy Regulatory Commission in the report. “Benchmarking Utility Clean Energy Deployment: 2014,” the first report from Ceres in partnership with Clean Edge on this subject, ranks the nation’s 32 largest electric utilities and their local subsidiaries on their renewable energy sales and energy efficiency savings. cont'd. The expected recovery in China, which accounts for more than 60 percent of global solar panel output, offers an early sign that manufacturers are succeeding in soaking up supply by building their own projects. The government’s push to promote developments closer to regions where electricity is needed most -- so-called distributed solar projects -- may also spur orders. Panel prices in China declined about 10 percent in the first six months of the year compared with the second half of last year, according to Bloomberg New Energy Finance. Higher tariffs imposed in the U.S. have had the opposite affect to what’s happened in China. Panel prices have increased about 15 percent since early June when the U.S. decided to apply preliminary duties on Chinese solar equipment imports, according to a global measure of panel prices. The U.S. Commerce Department acted again on July 25, proposing expanded penalties on some Chinese solar-energy imports in a victory for the U.S. unit of SolarWorld AG, which accused China of shifting production to Taiwan after it lost an earlier case. China is the world’s largest producer of electricity, surpassing the United States in 2011, with demand increasing alongside its strong, sustained growth in GDP. Electricity generation in China has increased 9.6% annually, from 2005 to 2013, reaching 5,425.1TWh of electricity. Coal-fired plants currently make up over two-thirds of power generation, which is partly the result of an abundance of coal in China. Despite this growth, the country expects demand to continue to increase at a rapid pace, reaching 7.295TWh of demand in 2020 and 11,595TWh in 2040. However, the growth in electricity production from coal-fired plants has resulted in an increase in air pollution and general lack of efficiency. China is now moving aggressively to curb pollution and increase the supply of renewable power. The central government has prohibited new coal-fired plants to be built around Shanghai, Guangzhou and Beijing, which is currently in the midst of having all of its coal plants being converted to natural gas. Its 12th Five Year Plan, running through 2015, targeted non-fossil fuel energy to account for 15% of total energy consumption. One of the key industries expected to help meet these goals is wind power. Storing electricity underwater in the form of compressed air is a tantalizing notion that could, if it works, help solve the intermittency problem of wind, solar, and other renewable sources. That “if” is a big one, though, because there are many details engineers have yet to nail down for underwater compressed-air energy storage (UW-CAES). One company that’s been trying to nail down those details is the Canadian start-up Hydrostor. I recently wrote about its plans to deploy the world’s first commercial UW-CAES system in Lake Ontario. 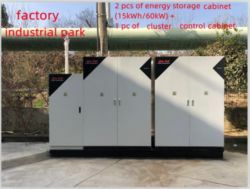 The Hydrostor system will use electricity from the Toronto Hydro power grid to run a compressor; the compressed air will then be stored in flexible energy bags submerged at a depth of about 80 meters. Later, the air will be run through a turbine when the energy is needed. For all that effort, the system will be able to supply just a megawatt of electricity for up to three hours. Eventually, the company is aiming for a capacity of 20 to 30 megawatts that can be discharged over 10 to 20 hours. But a big wind or solar farm would require a lot more storage than that.. cont'd. WASHINGTON, D.C. – In a significant ruling handed down today, a panel of judges at the World Trade Organization (WTO) accused the United States of violating global trade rules when it imposed punitive import duties in 2012 on many Chinese products, including solar panels. After the decision was announced, Rhone Resch, president and CEO of the Solar Energy Industries Association (SEIA), issued the following statement: "We are continuing to follow developments closely, but today's WTO decision is not expected to impact either the 2012 U.S. solar countervailing duty (CVD) order against China or any new CVD tied to the ongoing investigation until 2016, at the earliest. It's also important to remember that this decision is subject to an appeals process, which could take approximately 120 days. Assuming the decision is upheld on appeal, the United States would then have approximately one year to implement the decision. But even then, it's not clear whether the decision will result in any substantive modification of a solar CVD order against China." In this paper, we discuss the critical issues that sources and states face in evaluating EPA's proposal and developing plans to meet the Clean Power Plan requirements. As Summer kicks into full gear we can sit back and enjoy a bit of a break from the Tradeshow schedule. August will see a bit of a lull but starting September and intensifying in October the Alternative Energy tradeshow calendar is full! Here is a summary of what Tradeshows, Conferences & Exhibitions to look forward to in the coming months. The three products we offer are the PowerChip, a silicon based fuel cell product targeted for defense and commercial customers, the second product is the BuzzBar Suite that is targeted at consumers for cell phone and tablet charging, and the final product is the Formira product, which is an air based fuel cell technology that generates hydrogen for formic acid and that can be used for larger power ranges. The equipment's power requirements can be met by the fuel cell system for 17 to 19 days without being refueled, and that window could be pushed to 21 days if a storm prevented access during the normal refueling window. As a drop-in solution with Jet A/A-1 commercial aviation turbine fuel, this new Amyris-Total fuel can be seamlessly included in commercial aviation following the ASTM validation and amendment of the global standard. Web-based software improves the accuracy and efficiency of meeting payment obligations by providing lease management, automatic payment reminders, payment tracker, royalty calculator, and payment scheduler capabilities.